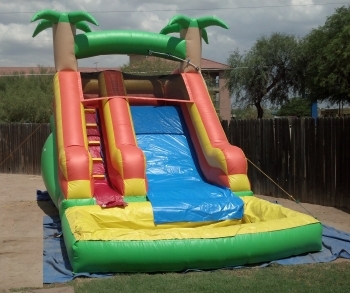 Our 14 Foot Mini Tropical Slide is great for your younger children. They will have fun splashing into the small pool at the bottom. This 14′ Mini Waterslide fits in the smaller backyards. It is perfect for your Toddlers to slide and splash around in on a Hot Tucson day. The Mini waterslides are perfect for those with smaller backyards. These Mini slides are designed for ages 8 and under. They provide hours of active fun and play to keep your children occupied and entertained with sliding splashing fun. Envision a Tropical getaway warm beaches and sand, providing your children with a fun filled diversion from everyday life that you will be proud to have entertaining your little guest. JumpMaxx prides ourselves in providing America with newer, cleaner, high end entertainment with inflatables like the Mini Tropical Slide and many others.